Products made from platinum are widely used not just in the sciences but in many cutting-edge technologies as they play an important role in technology development and basic technology research in many industrial fields. TANAKA uses the following precious metal materials in its scientific laboratory instruments. Platinum is a material with a high melting point of 1,768°C that exhibits high chemical stability. With easy extensibility and good workability, it is widely used in various analytical crucibles. This material is created by adding a few parts per million of additives to pure platinum to improve strength while maintaining the superior chemical stability and workability of platinum. This material enables easier removal of analysis samples because of its poorer wettability by many glasses and oxides, compared to platinum, and so it is regularly used for bead dishes for preparing samples for fluorescent X-ray analysis. One characteristic is its good draining characteristics that limit contamination by any remaining analysis sample. Because it undergoes solid solution strengthening, this material is harder and stronger than both platinum and T-1 platinum. Because it undergoes solid solution strengthening by rhodium, this material is harder and stronger than both platinum and T-1 platinum. Workability is very similar to platinum so it can be worked and molded in much the same way. Rhodium is known to dissolve in some glass materials, so it has the potential to alter optical characteristics of the melt. Like the PtAu5 alloy, one the important characteristic of this material is its poor wettability by glasses and oxides, but this material is actually even less wettable by glasses and oxides than the PtAu5 alloy. At 1,064°C, the melting point of gold is lower than that of platinum. This material has higher chemical stability than platinum, with easy extensibility and good workability characteristics. Wettability is dependent on the combination of platinum material type, glass type, temperature and environment. End-customer complained about a drop in precision of component analysis. So what was the secret to achieving high precision, high durability and low costs? Didn’t want to stock high cost products but wanted to be able to meet sudden orders. 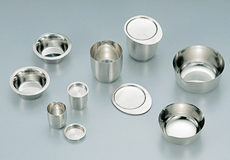 The answer was high quality platinum crucibles with 7 business day delivery.